They’re indispensable, and there are so many brands and types these days that it’s sometimes confusing. But when you're looking for a reliable Greeley plumber to sell and install all brands of hot water heaters, give us a call! We install and service traditional tank water heaters, tankless wall-hung unit, and hybrid water heater systems. We also do water heater repairs in Greeley and local communities. Not sure what you need? Here’s a brief intro to the basic types of tanks. Hot water heaters come in sizes from 40 gallon storage tanks to tanks holding more than 100 gallons. Whether a natural gas, LP, heating oil or electric hot water heater, these traditional tanks typically have a 5-10 year tank warranty and a one year labor warranty. 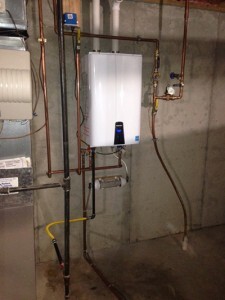 We can also install a tankless water heater in Greeley, CO and the surrounding area. These units are also called on-demand water heaters, and use high-powered burners to quickly heat water. Twenty two percent more energy efficient than gas-fired hot water tanks, these tanks are typically warrantied for 12-15 years. 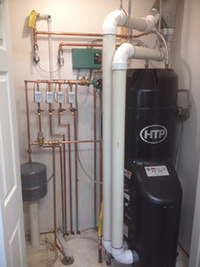 Installing or repairing a water heater is one of those jobs best left to a professional. Improper water heater installation can end in poor performance and high energy costs at best, and potential dangers at worst. And if your water heater is leaking or in need of maintenance, we bring all our years of plumbing and heating repair experience to the problem and solve it quickly and safely.